For all the strengths of the incumbent thermal fossil fuel system, mainly its energy density and transportability, it is not an inherently scalable technology – and it is vulnerable to one that is. So how do you pick three winners out of 2000? ..It’s easy when you look back, but it’s not so easy looking forward. So you could have been dead right on the fact that the auto industry— in fact, you probably couldn’t have predicted how big of an impact it would have. But …if you’d bought companies across the board you wouldn’t have made any money, because the economic characteristics of that business were not easy to define. I’ve always said the easier thing to do is figure out who loses. And what you really should have done in 1905 or so, when you saw what was going to happen with the auto is you should have gone short horses. 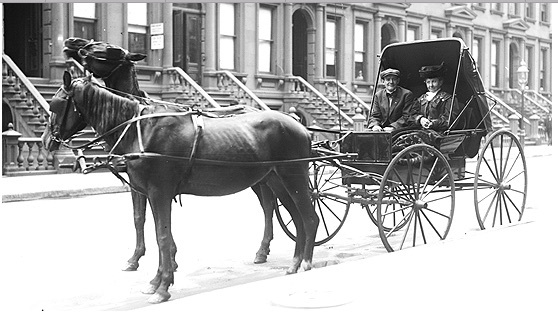 There were 20 million horses in 1900 and there’s about 4 million horses now. truth in regard to picking specific stocks: they suffer from the P = NP problem. The linguistic summary of what this means is short, but daunting: “every computational problem whose solution can be verified in polynomial time, can be solved in polynomial time”. A more accessible summary may perhaps be: “verifying a solution to complex computational problems often just takes simple multiplication: actually solving the problem requires the systemic trying out of lots of candidates”. And back to numbers again: take a computational problem that has 100 elements (N=100) – for example 100 target firms in a new market. If just computing one financial metric, eg highest return on sales last year, could provide a cast-iron forecast of future success, the computational time would be simply proportional to N, and maybe take a second to calculate. Suppose the task were more elaborate with a few more metrics, and proportional to say N3, the calculation would take a while longer, at 3 hours. But if the task is actually not polynomial, but exponential (2N), as many interesting problems in the real world are, where you have to also consider company supply chains, government policies, competitor action, technology breakthroughs, management stability and so on – then the task would take 400 quintillion years. Which is not eternity, but it is a very good approximation of it. Mathematicians assume therefore that P is not equal to NP, that is, most difficult or real-world calculations or forecasts have to use work-arounds, or smart rules of thumb, as Buffet suggests. This is because they can’t be solved directly in polynomial (human-scale) time – they literally take forever. Some research even suggests that this is why markets are never truly efficient. In 1905, confronting the impact of the automotive era, that short-hand method of predicting a market outcome was “shorting horses”, as a new technology came of age. Although impossible to predict the precise long-term winners of the new technology, it was at least possible to bet against a clearly waning technology en masse. A few high level numbers such as new technology growth rates and old technology demand decline could serve as good pointers to the future, and investors could bundle individual firms into a general bet against the long-established stock prices. Of course, as Buffett also points out, you have to be at least on the money on timing too – going short when everyone is bailing out won’t make you rich either. That brings us to the following analogous question: is it time to bet against the “horses” of the established fossil fuel energy system, as they are replaced by new energy technologies (solar, wind and EV engineering) – or is the smarter bet to hold them long? We can use the P/NP idea to aim for a relevant simplification of complexity wherever possible. At a time of industrial transition, as argued in this blog several times and very persuasively here, a focus on high-level marginal change in the energy sector may be more insightful than trying to discern the direction from a dense, inter-woven analysis of multiple metrics, issues and trends. 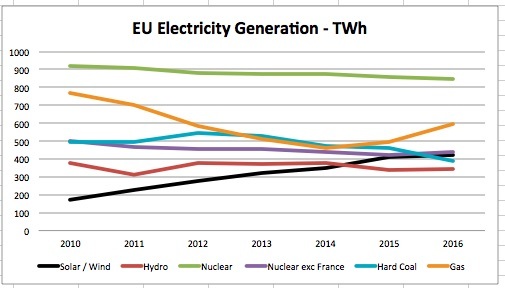 We start with some EU power sector charts below as an example. The first chart shows how the rise of solar and wind energy generation, in just a few years, has pushed these technologies ahead of hydro and coal, and equal with nuclear excluding France. 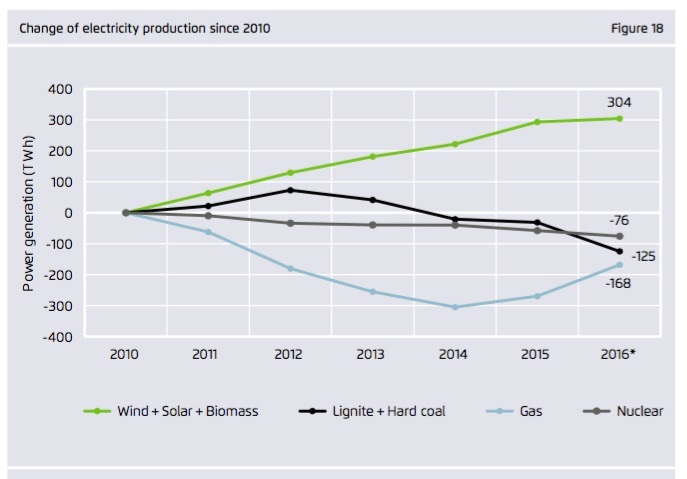 The second chart shows how the energy generation mix has shifted over time, with solar and wind filling the gap offered by declining shares of coal, nuclear and gas generation. Similar examples of this rapid change are shown here for the US, with wind power alone over-taking hydro last year (capacity ratios to net generation is similar for these two technologies), and in China where new wind/solar generating power additions are currently able to meet total demand requirement increases. All this leads to an important observation: it seems likely today’s incremental growth of power demand in all major economies – the EU, US and China – can be met by new technology deployment. Which suggests global incremental demand can therefore be absorbed by these technologies too. At this point, debates often get bogged down in issues regarding subsidies, political preferences, issues such as intermittency and so on. But that may not offer a solution in “polynomial” time – it will tend to lead us, exponentially, into a whole host of complex, uncertain and subjective issues. To avoid this we need a good simplifying, robust, and relevant work-around. So, to verify that solar / wind can absorb all new global energy demand – we should be able to use a straightforward, high-level calculation. Total global electricity consumption is currently ca 24,000TWh and growth rates are estimated to be about 1.5%pa for the next few years – this equates to approximately 360TWh pa incremental electrical power requirements. Note – this highlights the critical point of timing: the rapid rise in solar / wind technology is coinciding with a decline in overall energy demand growth. In the prior century, global energy growth averaged about 3% pa, meaning the incumbent fossil fuel energy system had to grow rapidly to accommodate it – hydro and nuclear, for various reasons, could not offer more than niche support. Current energy growth rates, however, are closer to the 1-1.5% pa range as energy intensive investment phases give way to a less intense consumption era. And so, as we enter this new energy era there is already almost 800GW of solar and wind technology deployed, with capacity growing at about 15-20%pa near-term. That means each year, at least in the medium-term, some 120-160GW of new solar / wind capacity may be added, or about 300-400TWh of new generating capability. 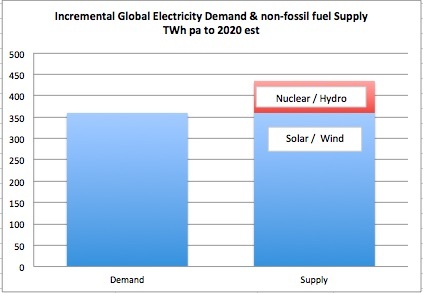 With the global consumption increase calculated to be 360TWh pa this means wind and solar can provide nearly all future electricity power growth requirements. 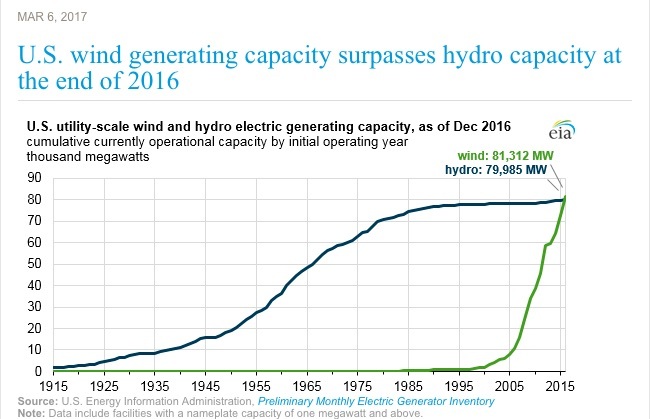 In combination with another 50-100TWh pa steady year-on-year growth from hydro and nuclear, no further new fossil fuel capacity is required, at the aggregate level. Implications for fossil fuels: For gas and coal, the remaining strategies are managed decline via lower pricing, internal competition or resistance via policy support. Each may be successful, for a time, in certain regions, but the overall trend is clear – the fossil fuel power sector will enter secular decline. What this means for individual actors, state or private, will be varied, but the thermal fuel sector is entering a long-term recession. For coal, the market has already reacted. As for gas, as long as it can step in to substitute coal, it will have growth opportunities. But overall energy competition in the power sector will now be intense, with constant pressure on prices and the widespread disruption of the industry structure. The complexity and particular issues within individual markets will continue – but the backdrop of new technologies able to absorb all new (declining) incremental demand will endure as a feature of the 21st energy landscape. Oil inhabits a different energy sector, dominating the transport market. This is a major strength but a large dependency. Much current analysis focuses on the impact of EV technology on oil demand, and implementation of Paris COP21 NDC accords to restrict emissions. This is because gasoline and diesel consumption account for over 55% of oil demand and growth. US gasoline consumption alone was about 9.5mb/d in 2016 accounting for almost 12% global crude demand by itself. The near-term movement in gasoline and diesel demand will therefore shape the overall crude oil picture, as other barrel products are either far lower in absolute demand (aviation kerosene) or in secular decline (residual fuel oil). The Carbontracker / Grantham analyses above, based on several scenarios, suggest oil demand peaks in 2020, but clearly EV technology penetration and climate policy implementation progress remain uncertain. However, these may not be the key determinants of transport fuel demand. A focus on high-level marginal change may again be useful. 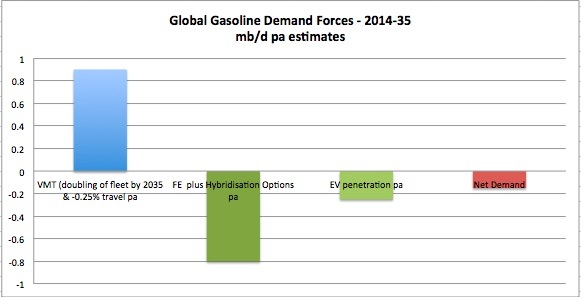 BP has provided a simplified model of overall gasoline demand to 2035 in the following paper, relying on only 3 inputs for marginal change: km travelled per vehicle (VMT) assuming doubling of the fleet, fuel efficiency improvements based on historical trends and the impact of EVs assuming various growth rates. Their chart, based on a high growth rate for EVs scenario, is reproduced below. 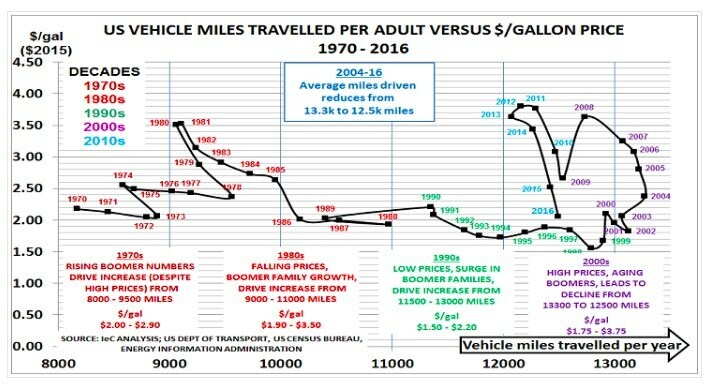 An alternative version of this chart is shown here, altering only one assumption: instead of VMT growing per vehicle by 0.25% pa in the BP case, it is assumed to fall by 0.25% pa. This already removes over 4mb/d from the BP estimate, and brings peak fuel demand toward 2024-25. As noted previously, a reduction in VMT per vehicle is more likely than a continual increase. This is because the global VMT figure used by BP is skewed toward US travel behaviour, which is a high outlier based on global averages. In fact, even US travel miles per capita are declining over time (see below), and the more heavily urbanized developing economies, with far lower road km per capita are unlikely to adopt similar patterns. Hence it’s more likely that global VMT per vehicle averages will fall over time, not rise. This is a critical base assumption that BP does not model or analyse in the report, and it has a major impact on the calculation as shown. This declining VMT model also brings gasoline growth below 250kb/d by 2019 – an important metric: as noted gasoline tends to generate about 30% of net oil demand increase, so if its growth drops below 250kb/d pa, overall oil demand growth will likely fall below a symbolic 1mb/d pa, signaling an imminent peak. Note – Diesel demand is unlikely to take up the slack – in fact it may do the reverse. 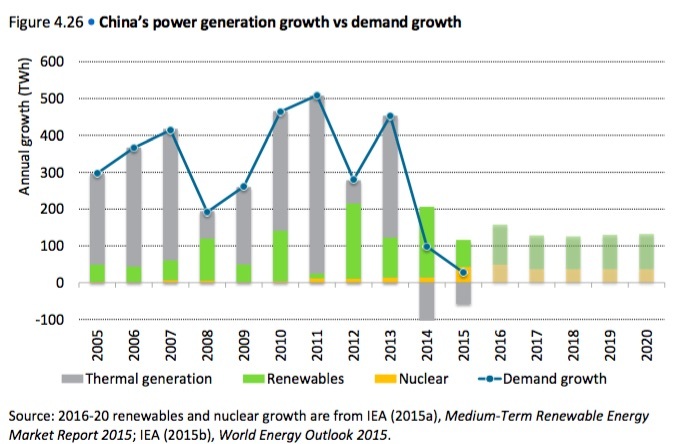 Its previous highest growth and second highest consumption market, China, has moved into decline over the past three years as energy intensive growth has plateaued, and its consumption growth in the EU has also fallen back. All of this highlights the fine line oil demand treads as energy intensive growth plateaus, and efficiency gains couple with new vehicle technology to reduce future unit consumption. These assumptions can be summarized using the average annual estimated change in demand from the three key components: VMT with fleet growth, but declining travel per vehicle, increases demand by 0.9mb/d pa, but Fuel Efficiency technologies and EV penetration combine to reduce it by just over 1.05mb/d pa. The world is rarely linear, but the summary highlights the two key forces at play – fuel efficiency plus hybridization technologies, coupled with the advent of EVs act as a brake on the growth of gasoline demand from fleet growth (and hence overall oil demand). Overall, the risks to oil demand growth are on the downside. Fuel efficiency technologies, EV penetration, urbanization and car utilization rates will all tend toward lower unit fuel consumption against base models, and hence quicker demand decline. Even if fuel efficiency policies are loosened in key countries such as the US, the other factors are likely to keep the trends at or above current rates. The key point is the fragile nature of continued demand growth, set among a number of emerging and strengthening fuel reduction technology initiatives. As noted, a simultaneous secular decline in diesel demand may also cause weaker oil demand growth than anticipated. The timeline to major change aligns with the recent bottom-up analyses – suggesting a transition to structural demand decline around 2020. As a leading indicator, the low growth metric of <250kb/d for gasoline and diesel demand growth in the next year or so will reinforce there is a pending peak. Of course, the incumbent fossil fuel industry could still react in a way that could mitigate the impact of increasing alternative supply at a time of secular demand reduction. However, that will almost certainly not be the industry response. It has a deep pro-cyclical culture based on an expectation of enduring upward demand, and continues to set out strategies of improved efficiency and increased production levels (see here and here and here). There are many other examples, eg here. In addition, even with temporary production constraints imposed by OPEC and non-OPEC firms, the rise of US shale productivity and the global backlog of vast prior investment from 2010-2015 indicates that oil and gas supply will likely remain high and increasing through 2020. The industry body IEA have referred to this phenomenon, correctly, as “relentless supply”. In sum, the incumbents have the assets, cashflow, culture and central sustaining scenarios to propel increased investment even if it meets or exceeds historic and future demand growth for both the power and transport sectors. Despite clear price signals, this will not deter the incumbents from continuing to spend against declining demand – this increases the vulnerability of the most complex and inflexible participants, mainly the international private firms and those loaded with expensive-to-extract portfolios, eg oil sands or ultra deep-water. Are the new technologies sustainable threats to the incumbent system? After all, nuclear and hydro also grew quickly, only to diminish and settle into energy niches. Fossil fuel extraction, production and combustion is based on large-scale, centralized technology which has diminishing economies of scale, and negative learning curves. This means the costs of fuel production increase steadily over time, and rapidly outside the low-cost oil and gas reservoirs of the Middle East, Russia and the US. In contrast, solar, wind, and the engineering behind EVs are scalable, universal technologies. They also avoid the major hazards of fossil fuel combustion: urban air quality erosion, general climate disruption and the energy security issues associated with the concentrated endowment of hydrocarbons in just a few locations. 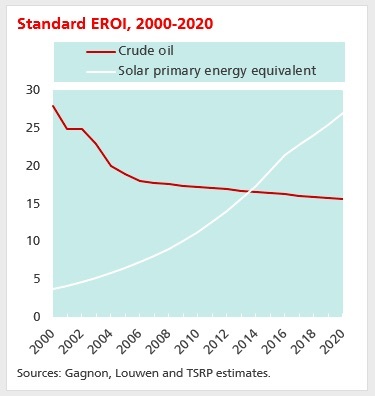 Up to date analysis of the economic return on investment (EROI) of solar from Trusted Sources, for example, indicates that it is now a more efficient energy technology than global oil and gas and nuclear. EROI is a controversial concept, but the analysis chimes with the emergence of wind and solar as significant providers of global energy generation. The costs of wind and solar, and EV technologies have decreased significantly as they have scaled: since 2010 they have all reduced by over 60-70%, and continue to decline, such is the power of experience curves and a deep market for new energy products. This marks them out from the current fossil fuel system (and nuclear and hydro) which are effective, but ultimately inflexible energy systems. The scalable, global technological character of solar, wind and EV engineering makes them a dispersed, learning and innovative energy phenomenon – which suggests that weaknesses of energy density and dispatchability will be overcome, promptly, by relentless scale innovation and technological advances such as storage and demand management. We come back to the P/NP issue, and the question posed. Is it time to short the fossil fuel incumbents, or hold them long and remain skeptical about change? The aggregate marginal demand analysis suggests that the new, scalable and learning technologies of wind, solar and EV engineering can provide enough economic and effective energy at the commercial and consumer scale to displace incremental fossil fuel requirements. This rapid rise of new energy capability coincides with the decline of overall energy demand as most major economies move from the intense investment stage to a consumer-based consumption era. 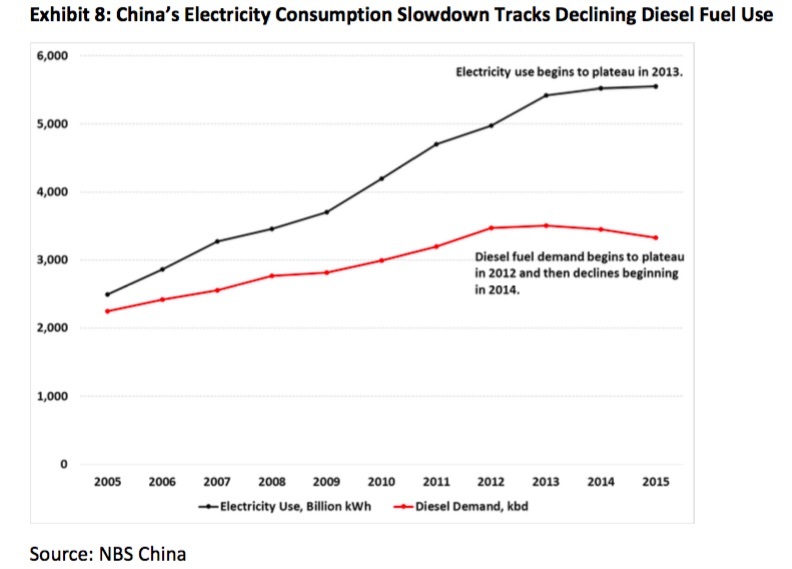 This latter development is maybe best captured for both power and transport demand in this chart of China’s demand transformation. chart source from this Baker Institute working paper. As the oil barrel is increasingly determined by consumer behaviour rather than industrial investment, and transport becomes more electrified and connected – the car as device – so the nature of energy provision will change. New global, dispersed, scalable technologies and engineering can now take up the slack in world incremental energy demand – either directly by provision, or indirectly by accelerating demand decline via efficiencies. They can also provide further advantages such as lower environmental and health impact, increased energy security and continued cost improvements that are likely to accelerate their adoption. The 20th century thermal energy barrel is now being superseded by a range of high-quality energy conversion technologies, along with engineering solutions based on scalable innovations. The incumbent fossil-fuel system is deeply-embedded and, perhaps counter-intuitively, will react by increasing the supply of thermal energy, exacerbating an energy surplus. This will hasten a major industry restructuring, possibly by or before 2020. The P/NP idea suggests we should now avoid trying to pick the individual winners of the new technology: for example between Tesla, Goldwind, Vestas, FirstSolar, BYD and so on. There are too many issues, policies, technologies, and reactions to transition that will occur to be sure of how an individual player will ultimately perform. Short the Horses – or to be a little bit more precise – short the expensive ones, now. My thanks to Kingsmill Bond of Trusted Sources for the original idea of marginal global change in the electricity sector (see links above) and the notion of shorting horses in this context.